When you have a diode with a certain barrier voltage (e.g., 0.7 V for Si) and you apply a voltage higher than this barrier potential, why does the voltage across the diode remain at 0.7V? I understand that the output voltage across the diode will increase as a sinusoidal input is applied until it reaches the 0.7 mark, I don't seem to understand why it remains constant after that point however. It makes sense to me that any potential greater than this barrier potential will allow current to pass, and correspondingly, the potential across the diode should be the applied voltage minus the 0.7 V.
And when you increase the current even further, the power dissipation becomes too large, and the diode eventually becomes a LED (light-emitting diode) and shortly afterwards a SED (smoke-emitting diode). So a larger forward voltage cannot happen in practice. Voltage is what we can observe and measure, but what is also changing is resistance. 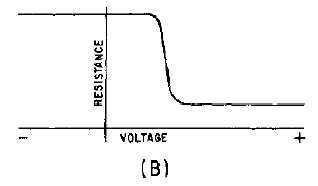 A diode starts out as a large resistance, as you apply voltage to it that resistance remains fairly constant until you approach the forward breakdown voltage. At that point the resistance starts to drop. Past the knee the resistance is very low. Any further increase after knee causes little change in the resistance. Since R has gone down, in order to maintain that voltage you have to increase the current... a lot. The diode has become a small resistor "switch" and can therefor be referred to as ON. The full voltage current relationship of a diode looks like this. The slope before the knee is the forward off conductance (1/R), the slope past the knee is the forward ON conductance. The actual math is of course a lot more complicated than that, but I find this description helps folks understand. why does the voltage across the diode remain at 0.7V? It doesn't. Most of the time, a constant 0.7 V is good enough, just as flat earth is good enough for driving around town. Diodes have a logarithmic relation between current through the diode and the voltage across the diode. A ten:1 increase in current causes 0.058 volts increase across the diode. (the 0.058 V depends on several parameters, but you can see that number in lots of on-chip-silicon bandgap voltage-references]. What if the current changes 1,000:1, either increasing or decreasing? You should expect to see (at least) 3 * 0.058 volts change in Vdiode. What if the current changes 10,000:1? Expect at least 4 * 0.058 volts. At high currents (1 mA or higher), the bulk resistance of the silicon starts to affect the logarithmic behavior, and you get more of a straight line relation between Idiode and Vdiode. By the way, this same behavior exists for bipolar transistor emitter-base diodes. Assuming 0.60000000 volts at 1 mA, at 1 µA, expect 3 * 0.058 V = 0.174 V less. 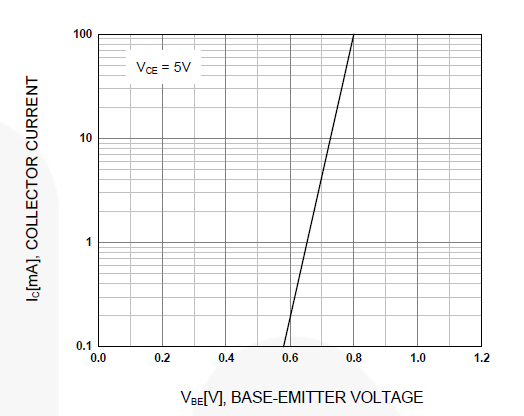 At 1 nanoampere, expect 6 * 0.058 V = 0.348 V less. At 1 picoampere, expect 9 * 0.058 volts = 0.522 volts less (ending up with only 78 millivolts across the diode); perhaps this pure-log behavior ceases to be an accurate tool, near zero volts Vdiode. Here is Vbe plot over 3 decades of Ic; we expect at least 3*0.058 volts or 0.174 volts; reality for this bipolar transistor is 0.23 volts. The point is that you can't "apply a voltage higher than this barrier potential", the diode doesn't let you. That is, the marginal impedance of the diode in conduction mode is less than the source impedance of your voltage supply: your voltage source can't drive more than "0.7V" across a 0.7V diode, so "the voltage across the diode remain[s] at 0.7V". Of course, the marginal impedance of a diode in conduction mode is not exactly zero, so there will be some rise in voltage if your voltage supply attempts to supply more than zero current. And the marginal impedance of your voltage supply may be very low, comparable to a diode, so it may be able to boost the diode voltage up quite high before the diode fails. Those are the second-order effects. The simple model of a diode, conducting above 0.7V, is a device that limits voltage by accepting infinite current. As the other answers have explained, the voltage is not constant at 0.7V, but based on the reference to barrier potential in your question, I suppose you realize this and are asking more about the semiconductor physics behind why this happens. The reason is that the depletion region of a diode (with zero voltage applies) creates the barrier potential, as you already noted, of about 0.7V (assuming a typical Silicon diode). As you apply forward voltage, the depletion region becomes smaller. With low voltage the larger depletion region restricts most current, and as the voltage increases, the reduced depletion region results in a reduction in resistance (and therefore increased current). This continues until approaching ~0.7V where the depletion region is very small as well as the resistance. This causes the exponential V-I relationship. This article has some good diagrams and explanations, as does the Wiki page. Once diode is switched ON with sufficient biasing, it acts a voltage source of 0.7 or 0.6(depends on material) with a small series resistor. So if we increase the input voltage, current across the small resistor will also increase. So as input voltage increases there is variation across output taken across diode. Usually diode is considered to be ideal, so there is no resistor in series. So o/p voltage across diode remains constant. Not the answer you're looking for? Browse other questions tagged voltage diodes or ask your own question. 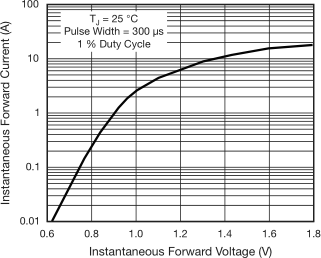 Does forward current of diode has any affect on forward voltage? Schottky diodes question. Which will power the board? Battery or USB? How many amperes without resistance? Diode built-in voltage and barrier voltage (forward bias voltage) are they almost equal? how do they relate to each other? Why is the Vbe threshold of a Si NPN transistor 0.7V and not -0.7V? Why the diode has higher impact on dc characteristics than ac?